Protection is the primary function of a hockey glove; specifically, it is meant to protect your wrists and hands from pucks and sticks. That is why there’s nothing more frustrating than a pair of gloves that end up working against you. 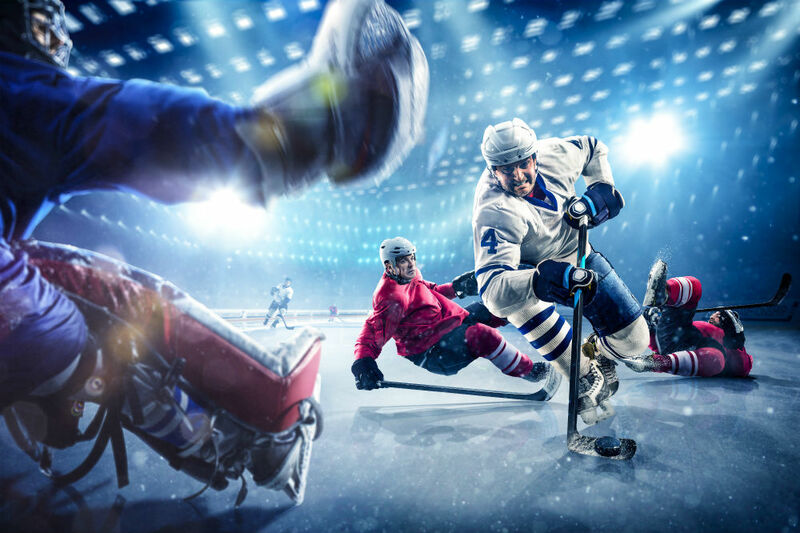 Hence, to ensure something like this never occurs when you are on the field, we reviewed five of the best hockey gloves available on the market and made by famous brands. After trying out several hockey gloves, we finally managed to settle on these five which are some of the best ones right now. Let us look at each of their features, pros, and cons briefly. 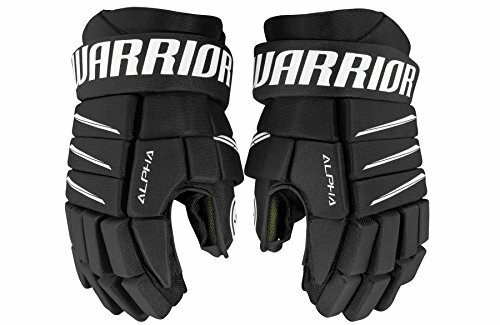 The Warrior Alpha QX5 Gloves Senior is a brilliant choice for those who play hockey casually or are absolute beginners. This glove weighing a little more than a pound offers solid protection and is available in navy blue. The glove is excellent as it needs no break-in time and you can use it right out of the box. The manufacturer also has done an excellent job in ensuring that the foam moves well and conforms to the hand. As for the exterior of the glove, it is made from TuffTek 2.0 nylon with an Alcatraz nylon cuff roll. The foam within is a thick, medium density EVA material which comes with a plastic lock thumb. On the other hand, the material of the palm is synthetic leather Clarino for great durability. It also comes with a moisture-wicking microfiber liner. The glove has a traditional hybrid fit which offers ample room in the cuff and fingers, and you can choose from sizes ranging from 13 inches to 15 inches. 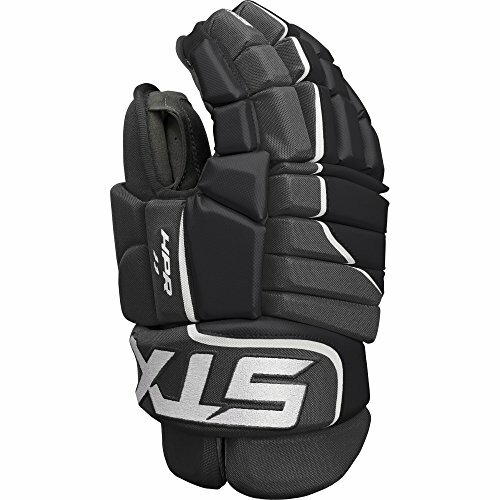 The STX Ice Hockey Stallion HPR 1.1 Gloves is one of the most comfortable gloves on the market. The company has made these gloves in a way that the player’s hands and wrists are well protected while giving them a ton of mobility. They offer this glove in sizes ranging from 11” to 15”, and there are also choices in colors including black, navy with red, navy with white, and red with white. The STX gloves are designed with the Power Fit technology, which helps in creating a roomy fit for a traditional feel with tapered finger for a more dynamic tactile response. The back of the hand of this glove fits quite loosely, which offers good mobility. The company has also used HexPro foam inside this glove, and the materials for the palm used are Pittard leather and super fabric. There is also open stitching in the knuckle break which will increase the range of finger dexterity. The Warrior’s QR Edge Gloves is a product meant for professional players. You can choose between three sizes ranging from 13 to 15 inches. There are five color choices as well which are black, navy, red, black with red and white, and navy with red and white. The backhand of the gloves is constructed using cable knit nylon, which offers great breathability and durability. The glove is also designed with an Exo Protect system, and the side of the thumb and fingers, as well as the cuff, has medium density foam. There are also plastic inserts on the top for impact protection. The glove also features an AxyFlex construction which is a stretch mesh between the body and the cuff of the glove. This gives extreme mobility without letting go of the protection. For the palm, it features a SmartPalm+ design with a brand new Gatorskin which is durable, soft, and water-resistant. Lastly, the glove has a tapered fit which offers a snug feel in the backhand and the finger. The Jetspeed FT390 Hockey Gloves is another product meant for professional players. It is available in sizes 13, 14, and 15 inches, and there are six different color options to choose from. The glove has a tapered fit with tightfitting fingers and backhand which offers amazing dexterity and comfort, while the anatomically open cuff provides excellent wrist mobility; combining that with the Pro FlexThumb, it provides a better grip. The glove’s exterior is made with a combination of pro selected polyester material and a pro-Clarino base palm which can endure high abrasion. Inside the gloves is pro level D/PE foams and inserts, which are light in weight and offer maximum protection especially for professional players. Lastly, the liner used on this glove is a polygiene treated laminated material along with a PU cushioning which offers a soft feel. The Bauer NSX Hockey Gloves is a pair that is meant for casual or amateur hockey players. There are three sizes which are 13, 14, and 15 inches, as well as three colors to choose from. The backhand and the fingers have MD foam with a polyester insert, while the thumb features an Ergo-flex. The shell features a polyester mesh and the palm has a nash with overlay. In terms of the fit, the backhand has a tapered fit which offers brilliant mobility and protection. The liner features a hydrophobic mesh that keeps it durable and water resistant. With these five best hockey gloves to choose from, you will not need to look any further since each of them offers fantastic protection and brilliant mobility when you are on the field. That being said, we have a clear winner amongst these five hockey gloves. We feel that if you choose the Warrior Covert QR Edge Hockey Gloves, you are going to be extremely content. This pair of gloves is jampacked with so many features that we didn’t even know we needed. Without a doubt, this glove will offer superb mobility while keeping you safe from the sticks and pucks.